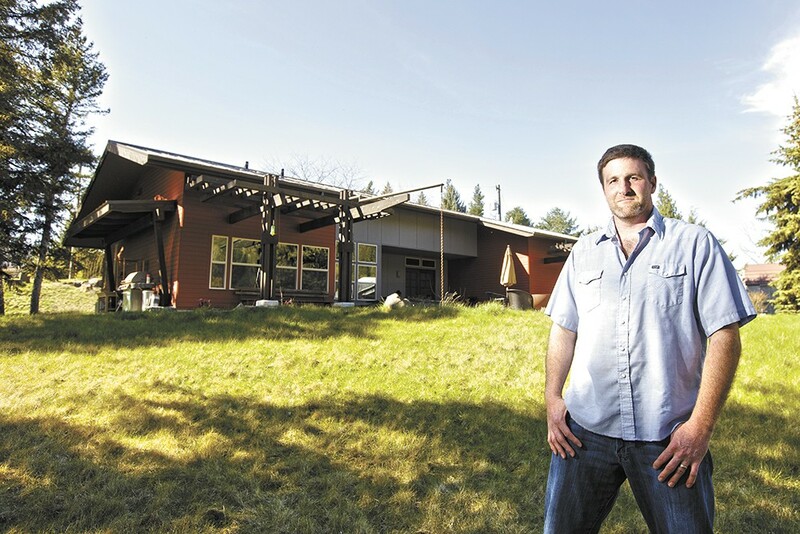 Gavin Tenold, the owner and general contractor of Pura Vida High Performance Builders, stands outside of an energy-efficient house he completed in Spokane. "When you walk into this house, you are definitely going to notice the walls," says Gavin Tenold, walking up the driveway to a house located north of Spokane that's being built by his company, Pura Vida High Performance Builders. He opens the door, revealing an interior that's not too different from any other house under construction, with exposed timber, workers scurrying about, the smell of paint in the air and a radio blaring in the background. Then he points to a few seemingly small aspects of the house that are indeed noticeable, such as the 18-inch-thick walls packed with insulation and the triple-paned windows, nearly all of which are situated on the building's south side to soak up sun. When it's finished, it'll be so energy efficient that it will require no furnace, and its owners will be able to heat it during the winter with a household appliance as small as a hair dryer. "That is not hyperbole," Tenold says emphatically. "That is not." Tenold is so certain of the energy efficiency of "passive building" technology (not to be confused with passive solar) because German architects have been using it for decades. Already mainstream in Europe, it's based on the simple idea that super-insulated, airtight buildings that are designed to take advantage of surrounding sunlight and shade will have far smaller heating and cooling costs than conventional homes. In the U.S., passive building is gradually taking hold, its proponents hailing the technique as a way to not only slash heating and cooling costs by 60 to 80 percent compared to conventional buildings, but also address a significant source of carbon emissions. The movement has gained a foothold in the Inland Northwest. Born and raised in Spokane, Tenold, 37, left to earn an English degree from Linfield College in Oregon. He returned after graduating and found work as a carpenter. After working on too many projects that he says were wasteful, Tenold started Pura Vida High Performance Builders in 2008 and focused on building the most energy-efficient homes possible. He still found himself unsatisfied. "I wanted my company to be producing products that were as conservative as possible with their overall energy use, and I was disappointed with some of the techniques and technology I was using," says Tenold. When he read about passive technology in Fine Homebuilding in 2011, he concluded that it surpassed all other green building methods. The next year he underwent training from the Passive House Institute US (PHIUS), receiving certification to work on passive buildings. He completed his first passive home for a couple in Elk last year that costs $20 a month to heat during the coldest months. He is building a second nearby and plans to start work on two more later this year. Passive design strategies are meant to capture energy already present, such as sunlight, instead of using active strategies, such as a furnace. A building can incorporate some passive elements, but Tenold's houses are built to meet specific standards set by PHIUS that are centered around airtightness, super-insulation, efficient mechanical systems, proper position of windows to maximize solar gains and efficient hot water systems. In order for its inhabitants to continuing breathing in an airtight environment, the building includes a ventilation system that produces hospital-quality air, says Tenold. In the summer shades can be extended over windows, cooling the house. All of it is built with fiberglass insulation, plywood and other conventional materials, says Tenold. If a house meets all of PHIUS' requirements, a house-shaped icon indicating it's a certified passive house will hang from its wall. Tenold wouldn't reveal how much the houses cost, but he says that they're not that much more expensive, especially for larger projects. "In a passive house, I'm installing a ventilation system," he says. "But I'm not installing a furnace, and you can take that cost savings and nearly achieve cost parity." Other green building certifications, such as LEED, only offer to reduce building energy costs by around 15 percent, which is why for architects such as Sam Rodell, who designed Tenold's homes, it's an absolute no-brainer to use passive design. Rodell says the need for this type of thinking makes even more sense, given numbers from the U.S. Environmental Protection Agency showing that residential and commercial buildings account for 34 percent of greenhouse gas emissions associated with electrical use. Joel White, executive officer for the Spokane Homebuilders Association, says he's taking a wait-and-see approach to passive construction. He says that Washington state already has one of the most stringent energy codes in the country, and problems with passive design (potentially air quality) could emerge. Todd Beyreuther, a research professor at Washington State University's Institute for Sustainable Design, says passive building is the future, but he's not convinced it'll be ushered in under PHIUS' banner. Instead, he says, builders will incorporate passive design elements without necessarily having their buildings certified by PHIUS. Mike Knezovich, PHIUS' director of communications, says 135 buildings in the U.S. have been certified by the institute, ranging from single-family homes to large multi-family apartment complexes. Last month, PHIUS revised a standard that'll make it more appealing to builders in the U.S. The original standard was developed in Germany for German climates. The new PHIUS standard takes into account the diversity of climates in the U.S., making it adoptable in a place like Florida.